For the past year and a half, the Cumberland Mall in Vineland has partnered with the CCC Music Department to bring shoppers live concerts and other events. The event, known as Music on the Mall, features several groups from the college each Friday evening, including the chorus, wind symphony, and jazz band. Chorus concerts feature renowned Philadelphia songwriter and guitarist Mick Choder, who has toured as a solo artist nationwide. Music on the Mall grew from a series of events held for the New Jersey chapter of Elwyn, an organization that helps people with special needs live independent lives. Following one of the charity concerts last spring, a Cumberland Mall manager approached Wind Symphony director Joe Akinskas. He was interested in bringing community groups to the mall to perform, and asked Akinskas if his groups would be willing to contribute. With that, the collaboration began, with the assistance of Lauren Canna, CCC music teacher and choir director.. By April, Music on the Mall was ready to debut, and has been successful ever since. Akinskas is glad to be in charge of three of the program’s four groups. “I like the opportunity to perform for the community. It’s created an incredible visibility for the entire program,” said Akinskas. Choral director Lauren Canna also had the community in mind when she chose to feature her group. During the fall and spring, the chorus performs pop and jazz standards that many shoppers know by heart. During the holidays, they switch to winter favorites. 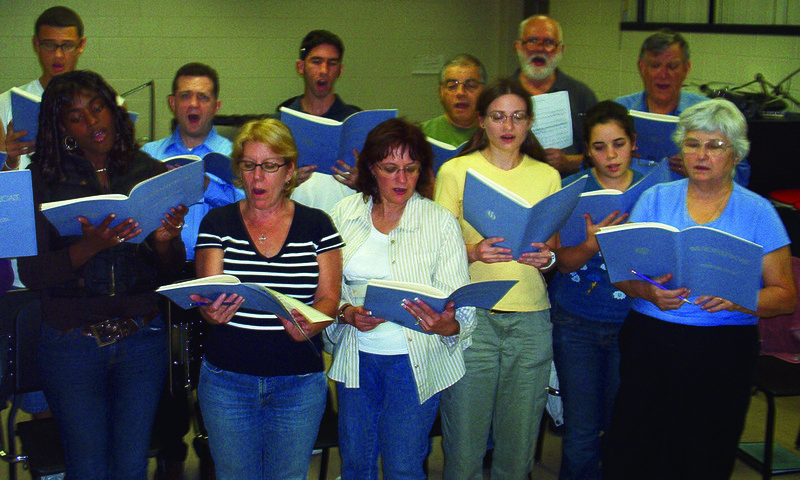 The CCC Chorus rehearses on Tuesday nights at 7pm in room S1 in the Fine Arts building. The Jazz Band also meets in the Fine and Performing Arts building on Wednesdays at 6pm, followed immediately by the Wind Symphony at 7pm. All instruments are accepted in the Wind Symphony, however limited for the Jazz Band. For information about either group, contact their respective directors. Seasonal affect disorder sweeps the country. Colleges and universities announce the observation of sadness, lack of attendance, and the lack of class participation from the students. The change in the season brings about change in students. With the changes in the season professors report the many eye-catching disturbances of the classroom throughout the campus. Campus blues can hit at any given time; when students feel a sense of hopelessness; suddenly college just isn’t as exciting as it was at enrollment time. Sleeping late during the am hours and not at all during the pm hours attacks the body in many ways. Emotionally, the students lose focus on classes and want to be left alone, feeling hopeless about life itself. Socially, friends and family seem to take the back seat in their lives, not knowing exactly how far to push the student. Physically the student may experience a breakdown in the body due to poor nutrition and a lack of rest, causing fatigue and pain. According to the National Institute of Mental Health, students report what they have in common. A few students identity that is to remain confidential give testimonies about their seasonal campus experiences. John says that during his junior year of college he felt exhausted and couldn’t finish assignments, he also drank “A LOT”. John couldn’t enjoy life like his friends did. Leah says that when she took on a part time job and started living off campus, her course work fell apart. She couldn’t concentrate or sleep, and was always irritable and angry. Marta says that she was always anxious and never had much confidence. College was harder than she expected, especially when her parents got a divorce. All she did was cry, sleep, and feel waves of panic. Awareness is the first key to getting help with depression; it comes in many forms, just to name a few clinical depression, major depression, dysthymia, and manic depression also known a bipolar disorder. Symptoms of minor sadness, loss of appetite or an increase in the appetite, loss of daily interest, and lack of concentration are common symptoms and can be easily treated. More serious symptoms include major hopelessness, changes in one’s social life, severe fatigue, and even suicide. These symptoms are very serious and require treatment from a mental health care provider, counseling, and lots of support from family and friends. If students are aware of the different symptoms that they may experience, it becomes easier to ask for help. Life on campus can be overwhelming and cause depression during difficult times in the lives of students. Students should never feel ashamed about being depressed. Often depression is caused by controlled and uncontrolled circumstances in one’s life, financial difficulty, family issues, chemical imbalances, genetic predispositions, the loss of loved ones, and tragedy. Depression is common by human nature and is not a sign of weakness. Three different students, with three different personalities, during three different school years, share a common experience: “Depression”. College students require a great deal of support throughout their college years. Positive motivation plays a big part of college success, students must tell themselves that they are in different places of their lives, which calls for maturity, organization, proper nutrition, and exercise. Be good to yourself by making time for activities, hobbies, and just a little R&R. ealthy lives encourage students that may recognize that they are experiencing symptoms of depression to immediately seek help by a health care professional. On or off campus counseling is an important step towards feeling better. 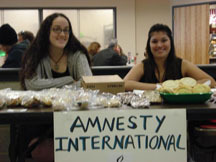 CCC students are improving the life for people local and abroad with Amnesty International. Through education, a belief that knowledge comes understanding and compassion, members of AI are hopeful that a difference can be made in our global community. “ We are here to educate our small community too, not like we are isolated, but Knowledge is Power and with knowledge then we can make a difference,” said Breanne Buccos, Amnesty club secretary. Twelve CCC students with Amnesty club ventured to New York Thursday, November 15 to attend public program at the Smithsonian National Museum. The program, Maze Of Injustice, revealed a harsh reality. “ The failure to protect indigenous women from sexual violence in the USA that also entails Native American women,” said Christina Arkainno, President of the Amnesty Club. Arkainno said this educational trip’s purpose was to help get people to come and see some of the work that Amnesty does, and to hear it from the top AIUSA, so that our members become proactive and have fun. Executive Directory Larry Cox was present and two Native American speakers were there to discuss Women ’s Rights and the their affliction. Buccos said, “ thanks to the students and faulty with the bake sale, we were able to go on the trip and it was a success an educational experience to enlighten us on the tragic conditions in which the rights of these women are being violated still in out nation”. Arkainno, and Erin Gillespie, Vice President of the Amnesty Club, are passionate about human rights, and welcome their customers to the table to try some baked goods. Among the goodies were hands shaped to represent the imprint that everyone can make on our world. Arkainno and Gillespie, were all smiles, selling baked goods in the cafeteria, November 5th to raise money for the club, raising around $150 for the trip. Amnesty International undertakes research and action focused on preventing and ending grave abuses of the rights to physical and mental integrity, freedom of conscience and expression, and freedom from discrimination, within the context of its work to promote all human rights, according to amnestyusa.org. “ People’s lives are being lost, we cannot just sit back and do nothing; our duty is to make sure they have freedom, a right to life, we are all humans and we need to look out for each other,” empathized Arkainno. “ There are so many people all over the world, their freedom is being taken, it’s hard to put it into words,” Gillespie. I am nineteen years old, a sophomore in college, and like many other people of the world, I am a MySpace addict. Although I do not visit my old friend Tom (the creator of MySpace) as much as I use to, I do manage to check up on it at least once a week. If I had known then how the addiction worked, I would have never let myself experiment with MySpace. At first it seemed like innocent fun, but MySpace was the root of many acquired problems. Who would have thought that girls you did not get along with would check your MySpace and catch you talking about them, or that your boyfriend would be stupid enough to send other girls comments? Not only have people taken MySpace to the extreme, it has even ruined friendships. To be moved down a person’s contact list or to be removed from a user’s “top friends” is the biggest insult one can receive. I am not sure Tom even realized what he was creating. It starts off with a simple desire to see what new friends you have made for your page. As soon as you make a few friends then you can start communicating with them by sending comments, picture comments, messages etc. You think at first that it is one of life’s simple pleasures and that it will eventually get old to you, but the truth of the matter is, it doesn’t. You will find yourself wondering around your house when you decide you have nothing better to do than check the status on your MySpace account. After time you will find yourself racing to the computer to check your account even when you’re running late for school. Even after being warned, no body can prepare themselves for the strong hold MySpace has on ones mind. You begin to promise yourself you wont check it, it’s a stupid website that you won’t let steal your time. But unfortunately, this promise was made to be broken. You may even rise above the others and delete your MySpace so you will not be tempted to log on, but not even this can scare MySpace because it knows that they all come back. Sadly enough there is no hope for us long time users and if you are a beginner or better yet haven’t even started, my simple advice to you is, don’t. According to Coach Marketto, this year had the best Cross Country team since the start of the program six years ago. With the largest team in the Garden State Athletic Conference, Region XIX, and the Northeast District, they stayed in the top ten on a national level for the majority of the season. They placed second in Region XIX and third at Districts. “It’s the best team we’ve had in six years and its very exciting,” replied Marketto when asked about his team as a whole. Leading the men’s team this year was Jamar Mack from Bridgeton. Mack managed to place first eight out of the nine meets this past season. He shattered the team’s previous record by two minutes and seventeen seconds and he holds six of the top ten times on the Duke’s XC Top Ten Times List. This year the women’s team was only able to compete as a full team in only one of their nine meets due to there only being five runners. The Region XIX Meet was the only meet in six years that the women’s team competed as a whole team. They placed second and they ran three to five strong in six out of the nine meets. The only woman to return to the team this year was Desiree Lara, who accomplished her three personal goals that she set for herself this year. Her goals were to beat her personal best time, get onto the women’s top ten list, and make it to All-American. She accomplished all of these things with flying colors and she will be named Academic All-American for the second year in a row and even has a shot a becoming Distinguished Academic All-American. Another highlight of the year was the fourth annual Dukes Invitational. Participating were twelve men’s teams and eight women’s teams, which combined made the invitational the biggest turn out so far. 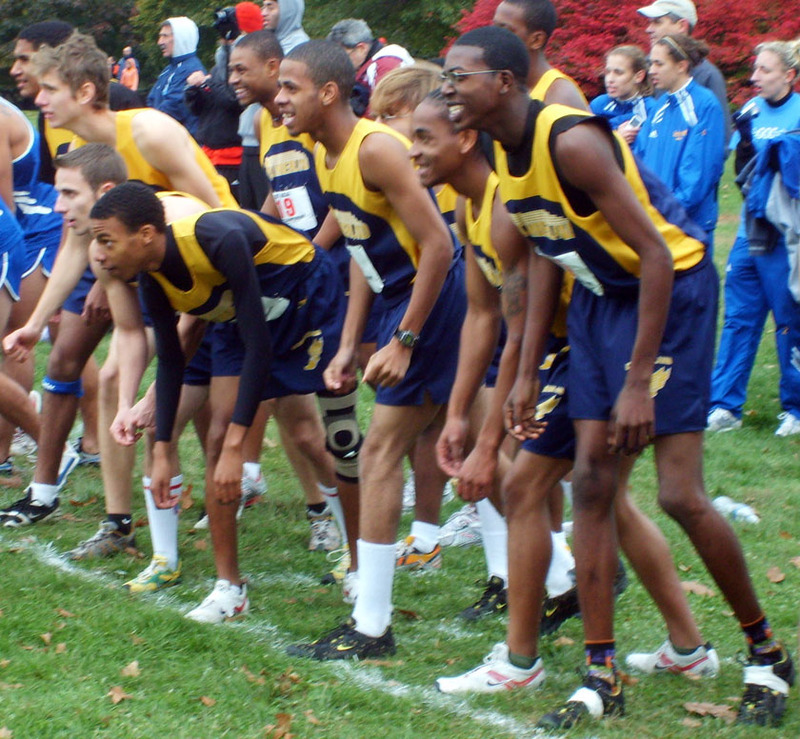 In addition to the Invitational was the Cumberland County HS Cross Country Championship Meet, which helped to raise funds and make promising contacts with potential athletes. The second annual Kids Academy Cross Country Track Camp was also better than last year’s boasting over fifty campers and raising a profit of twelve hundred dollars. The only problem that arose this year was the loss of the 5K and 8K campus courses due to construction, however the well rounded team managed to find other locations to host races and practices. It seems that the Dukes Cross Country team is still raising the bar and it doesn’t look like they’ll be slowing down anytime soon. Rehearsals are under way for the cast of Rumors’ /> The Fall semester has only been under way for two weeks, and the Theater Department at CCC is already in full swing. On the first day of classes, flyers had started to circulate announcing auditions for the fall play “Rumors,” a greatly anticipated event on campus for the fall. Their first show of the season is Neil Simon’s Rumors. The show began its rehearsals during the second week of the semester. With only eight weeks to rehearse, many hours of memorizing lines and character development, the ten-member cast has a lot of work ahead of them. Director Deborah Bradshaw, who is beginning her third year teaching at Cumberland, couldn’t get enough of the script. She recalled, “I read it once, and then again, and then a third time, and it kept making me laugh!” She also named Neil Simon, a Pulitzer Prize and Tony Award winner who also has authored over sixty plays and screenplays, as one of her favorite playwrights. The Theater Department puts on several shows a year, including a big musical in the spring (be on the lookout for 42nd Street in Spring 2008). This year, however, Bradshaw decided the group was ready for something a little different. In the past, the number of actors needed for the fall show has been thirty to forty, but Rumors requires only ten people main characters with understudies. Though this heightens the competition for hopefuls who audition, it also brings a deeper sense of closeness to the cast. As for the show, Bradshaw said, “I thought we really needed to do a comedy.” Comedy definitely sums up the plot in one word. The deputy mayor of New York City is going to throw an elegant party for his tenth anniversary, but somehow ends up injured in the process (don’t worry, though; it’s only a flesh wound!). To further ruin the celebration plans, his wife is nowhere to be found. The arriving guests have quite a scene laid out before them. Though the party-goers have no idea what has happened to the deputy mayor or his wife. The last thing they want is for such chaotic news to reach the media. But, what happens when details start to blur and the revelers forget who has said what to whom? The result is a “side-splitting, door-slamming farce” that audiences will be sure to get a kick out of. Rumors will be presented at the George P. Luciano Theater in the Guaracini Center. Show dates and times are November 16th and 17th at 8pm, and November 18th at 3pm. Tickets are $12 for adults, $8 for CCC students with ID, and $5 for senior citizens over the age of 55. There will be reserved seating, so be sure to buy your tickets early if you’d like a good view. To purchase tickets, call the Box Office at 856-692-TIXX (8499), or buy them in person at the Guaracini Center. For more information about Rumors, auditioning for upcoming shows, or the A.A. and A.F.A. degrees in Theater, contact Deborah Bradshaw at 692-8600, ext. 456. You can also email Ms. Bradshaw at dbradshaw@cccnj.edu. As the fall semester enters its final weeks, the Cumberland County College women’s basketball team, under coach Cyndy Wilks, is getting ready to rumble. Following a brief position as a recruiting coach here at CCC, Wilks’s leads the team in her first season as head coach. However, the 25-year-old is no stranger to the game, playing for both Bridgeton High School and Virginia Commonwealth University, a Division I school. Wilks is also a 4th grade Math and Science teacher at the Cherry Street School in Bridgeton. Despite playing without knowing their opponent, the girls have already won one of their two scrimmages. Wilks could not be more pleased with her team, which boasts seven incoming freshmen and one returning player. “They’re playing basketball because they love it, and they’re getting every Division I experience I can give them.” Some of the team members play for fun, while others are interested in taking their game further after graduation, but Wilks does her best to make their time here worthwhile. If you are a CCC student interested in playing on the women’s basketball team, see Coach Wilks in the Athletic Office upstairs in the Gym, next to the Fitness Center. You must have twelve credits, and all are welcome. Be sure to support the Lady Dukes at their first home game December 15th.